The Tangram Red 2013 is the second vintage of the top of the range Bordeaux-style blend from Durbanville Hills, selling for the not inconsiderable price of R895 a bottle. What do you get for your money? 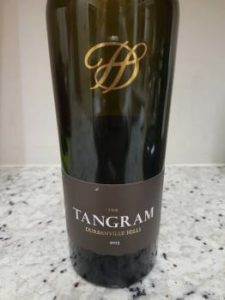 It’s a blend of 65% Cabernet Sauvignon, 20% Merlot, 10% Cabernet Franc, 3% Petit Verdot and 2% Malbec, the components matured separately for 24 months in 100% new French oak before blending. The nose is classic – red and black fruit, green olive, herbs, a touch of oyster shell and oak spice. The palate, meanwhile, is full and flavourful. Extraction is well done and the wine has a nice sleekness about it but with the alcohol at 14.7%, there’s a slight heat to the finish. Whatever else you might say about it, it doesn’t fail for a lack of ambition.